RB Prestige, born out of over 20 years’ experience, is a company I wanted to be renowned for a high emphasis on customer service and offering Prestige to all when buying your next, first or dream car. Every person that walks through our show room door deserves a prestige service as they are placing their trust and business with me and my team. Buying your next car, especially first and always dream car, is an exciting time and what gives us the most satisfaction is to make the experience of purchasing your car enjoyable and not daunting. Our expertise enables us to do this for you and gives you the confidence that we will also deliver the excellent aftersale care you should expect and hope for; MOT’s, servicing, repair and customisation. Each month we will be writing about all things cars; from the noise, to the look, to funding, insurance and even the funny side of things as we embark on our journey to be the first choice provider to you. 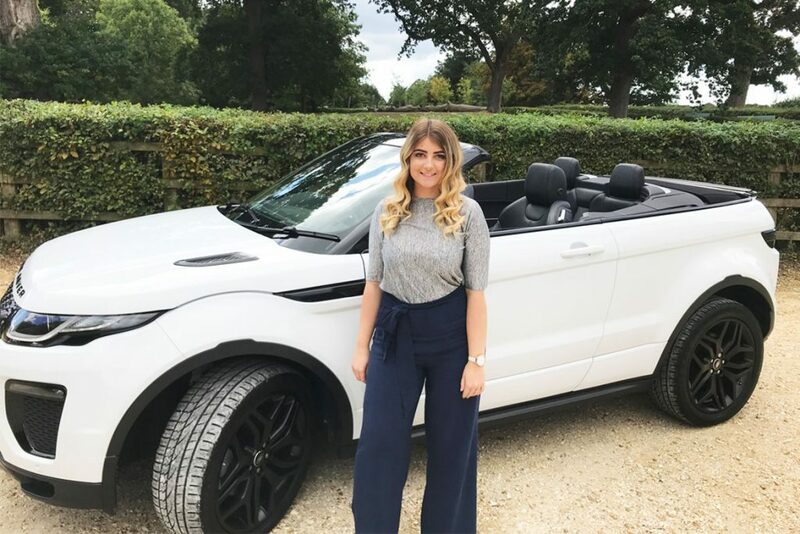 This week, Georgia (pictured above), our RB team co-ordinator, was very excited when I offered her the chance to get out from behind her desk to test drive the Range Rover Evoque Convertible, and see what myself and Kyran were banging on about. 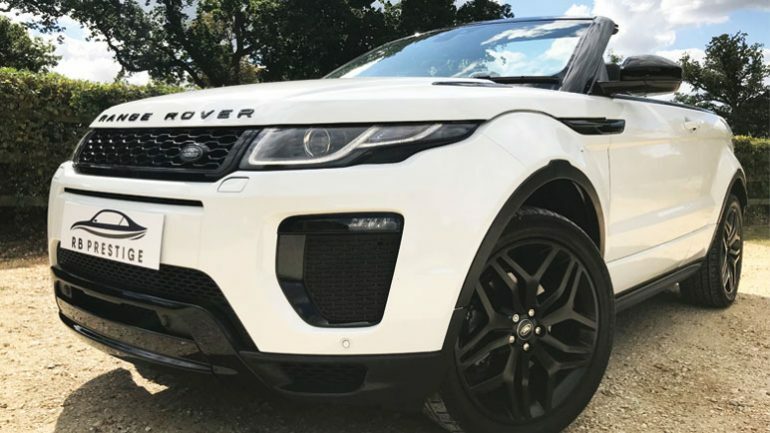 “I was so excited when I saw the beautiful Evoque convertible arrive at the showroom. It looked so chic and very different to anything I had seen before in person. “Luckily for me the sun emerged just as we drove away from the showroom, so Rob showed me how to put down the roof as we drove through Westbourne. I have had rides in convertibles before, but this was a whole different experience. It had the feel of a convertible sports car but this time I was up high, looking down on everyone else. I put on one of my favourite tracks which sounded crystal-clear through the Meridian sound system. This was my dream car. I loved all the little extras that gave it that touch of class like the electric heated leather effect sport seats, the heated steering wheel and the touchscreen display, making it very clear that you are driving a prestige vehicle with every bend. 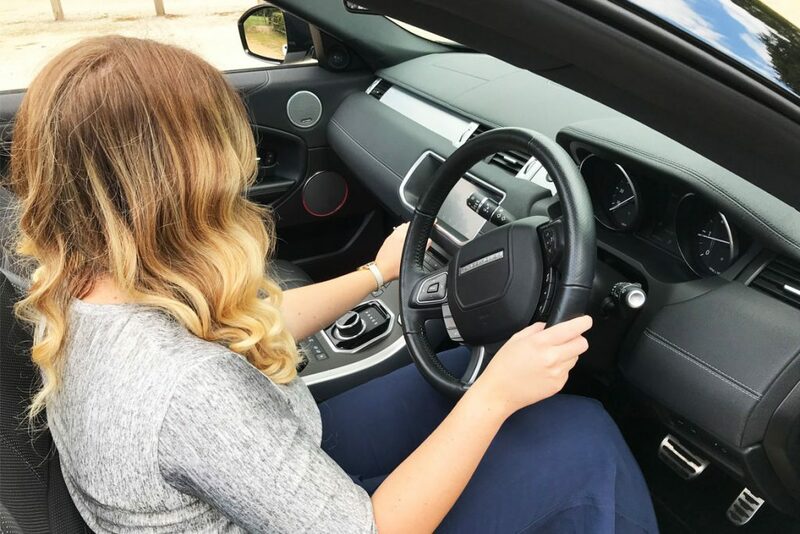 “I loved the town experience, but I am a bit of a country girl at heart and the Range Rover appealed to me because of its off-road capability. Thus, I was intrigued to see how such a stylish car would perform off the high street. We headed up to Upton Park to trial it, and I was not left disappointed. I had driven SUVs off road before but driving the Evoque convertible was an incredible surprise. The openness of the car meant we could enjoy the nature around us and smell the onset of autumn in the forest. The car had transformed into a work horse and as we bounced along it felt capable and secure. The Evoque is the smallest in the Range (pun alert!) and this convertible comes with a 180bhp 2.0 -litre diesel engine. It offers a smooth drive with automatic transmission, excellent too for driving on motorways. This is where the cruise control comes into its own and there is also the added benefit of lane control and lane departure warning. The cabin exudes comfort with bolster, 4-way lumbar front heated seats, heated steering wheel for those cold mornings and has an ambient lighting – interior package. We are extremely proud of all the Evoques that we have supplied and, while the hard top versions are proving extremely affordable now, it is brilliant to see the convertible start to appear on the used car market. We also express a huge welcome to any clients and customers new to RB Prestige to come in and see us at the showroom. Purchasing a car is such an important process and we know it takes a while to decide on the car that is the right fit for you. That’s where our expertise, support and advice comes in; without being sold to. Whether you want Ford or Ferrari, we want to have fun helping you find the right car and the many methods to own it that can be tailored to you. That HAS to be the fun part! Thank you for sharing our new House journey. We very much look forward to writing for you in the upcoming issues.